Our Early Bird ticket sale has been a great success. We have sold hundreds of tickets, and expect to sell out the entire run. Early Bird prices end this Tuesday, 2 April. If you'd like the best seats in the house, at the best price we can offer, this is the final week to get them. Regular opening night tickets still available. PAULINE runs 23, 25, 27, 29 and 31 May 2014 at The York. We are very pleased to announce that Adam Fisher has joined the cast of PAULINE, and will be singing the role of The Tenor. Originally from White Rock, and a graduate of UBC Opera, Adam joined the Emerging Artists Program with Calgary Opera in 2010, singing the roles of Ferrando in Cosi fan tutte, Wilhelm in The Brothers Grimm (Burry), and several roles in the world premiere of Bramwell Tovey's The Inventor. In 2012, Adam was invited to the Music Academy of the West by Marilyn Horne, leading the cast as Tom Rakewell in Stravinsky's Rake's Progress. In Toronto, Adam sang Nicias in Voicebox/Opera in Concert's performance of Massenet's Thais, and Raoul in La Vie Parisienne with Toronto Operetta Theatre. Debuts in the 2013/14 season include Pedrillo in Opera Atelier's acclaimed production of Mozart's Abduction from the Seraglio, Britten's Serenade for Tenor, Horn and Strings with Ottawa's Thirteen Strings Chamber Orchestra, Lieutenant Cable in South Pacific with Pacific Opera Victoria, and Alfred in Edmonton Opera's Die Fledermaus. 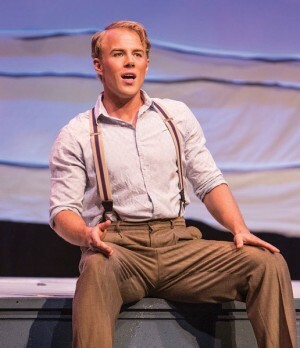 This is Adam's first appearance with City Opera Vancouver. Adam will take on the roles created by tenor Ken Lavigne in workshops for the creation of Pauline. We thank Ken - greatly - for his involvement in this project. I am honoured. This remarkable group of artists--with their rigour, commitment and diversity--will do justice to a figure of immense cultural and historical importance. A work for the stage that tackles the mixed race, life and persona of Pauline Johnson is long overdue. Our goal is to honour her as a true pioneer, forging new territory in poetry, performance and cross-cultural politics. Her extraordinary popularity, her verve, determination and artistry were from all accounts at once captivating, intellectually provocative and emotionally moving. With a contemporary work that takes as its starting point the very end of her life here in Vancouver, Pauline is a ghost story of sorts--a testament to a heroic struggle with the path of her life, the sum of her choices and ambitions--in all its glory and remorse, its defiance and surrender, its love and imagination. This is an image of Ellie Higginson as an IODE lady. Her costume is being constructed in Evergreen silk. 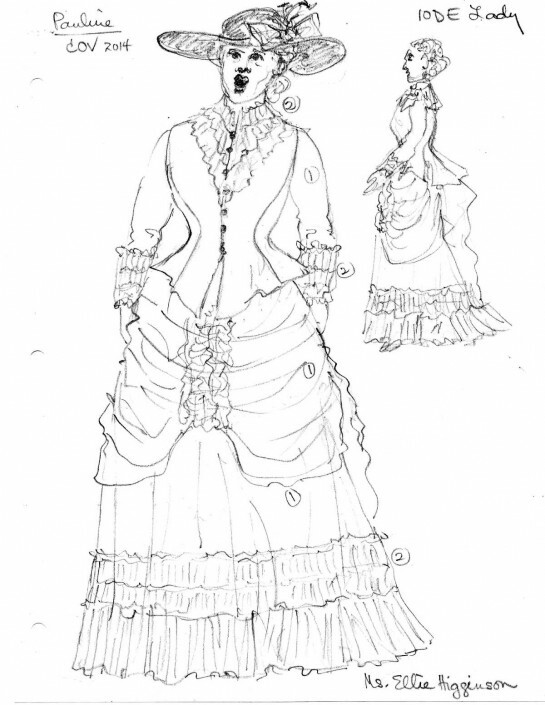 Many of the pieces in our opera are actual vintage items: Pauline's nightrobe, the women's hats, the men's frockcoats etc. Please save the date: Thursday evening, 20 November 2014. An evening Con amici e Puccini, at the Italian Cultural Centre. 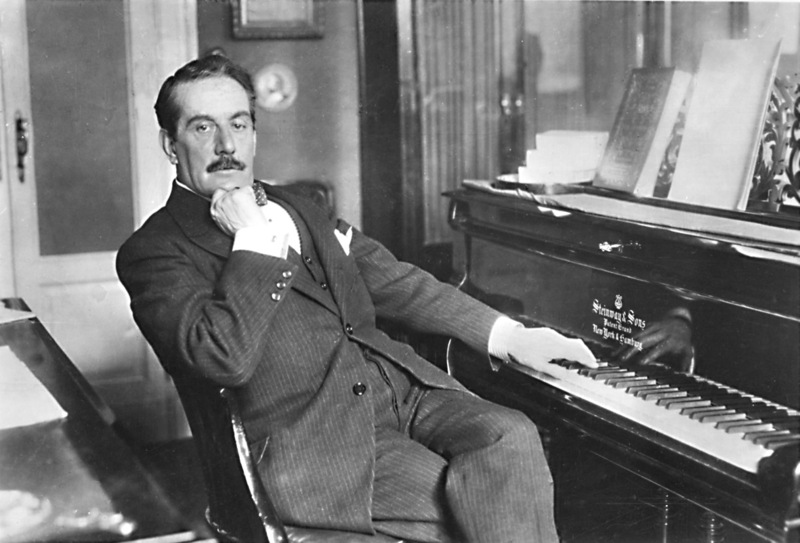 The great lyric composer died 90 years ago in November, and we will remember him. Please join us. The Canadian Press has declared that PAULINE is one of "Five buzz-worthy theatre productions for Canadians to see in 2014."